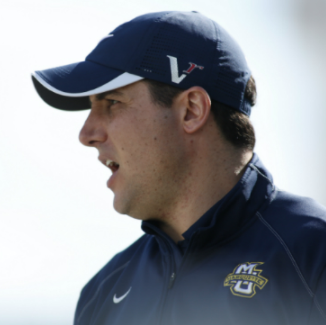 In just five seasons of competition, Joe Amplo has built the Marquette program into a BIG EAST Conference Champion and established himself as one of the top head coaches in NCAA Division I men’s lacrosse. Amplo, a Team USA assistant coach and member of the NCAA Division I Men’s Lacrosse Committee, was named the first head coach in Marquette history on Feb. 4, 2011 and has built a program in his likeness to national relevance. Marquette has qualified for the semifinals of the BIG EAST tournament during each year as a league member and has increased its overall win total all but one season. Thirteen Golden Eagles have earned 22 All-BIG EAST honors in four conference campaigns, while five players have earned USILA All-America recognition and eight have been selected in either the NLL or MLL drafts. Amplo led MU on a surprise run to the NCAA tournament in 2017 by becoming the first No. 4 seed to win the BIG EAST Championship after upsetting top-seeded and No. 2 Denver, 11-8, in the semifinals. The Golden Eagles then downed tournament-host Providence in the final as junior goalie Cole Blazer took home most outstanding player honors. MU earned the league’s automatic bid to the NCAA Championship where it fell to fourth-seeded and No. 7 Notre Dame 15-9 in the first round. Amplo came to Marquette with 11 years of collegiate coaching experience, 10 of which came at his alma mater, Hofstra University. He served as associate head coach with the Pride for three years, and was the team’s defensive coordinator. During his time at Hofstra, Amplo participated in 11 NCAA Championships, three as a student-athlete and eight as a coach, the most recent of which came in 2011. That year, Hofstra had the nation’s No. 1 defense, boasting the lowest goals against average in the country. Amplo joined the Hofstra coaching staff as a graduate assistant in 1999 and remained there until 2001 when he took an assistant coaching position at the University of Pennsylvania. After one year at Penn, Amplo returned to Long Island where he remained through the 2011 season. In his first stint with Hofstra, Amplo worked under then-head coach John Danowski, now the coach of three-time NCAA Champion Duke University..
As a student-athlete, he was an All-America East performer as a senior in 1999 when he started all 16 games and led the school to the quarterfinals of the NCAA Championship. He played in 58 games in his career and notched 91 ground balls, 40 of which came during his senior season. Amplo is active on the lecture circuit and is the founder of the Team Amplify, which operates clinics, camps and competitive club teams for the Milwaukee-area lacrosse community. He has also been involved with the Friends of Jaclyn Foundation and the Milwaukee Eagles wheelchair lacrosse team, which he partners with the Milwaukee VA Hospital to help coach disabled and able-bodied United States veterans. The Farmingville, New York, native attended Sachem High School in Lake Ronkonkoma, New York, where he earned four letters in both lacrosse and football and was an all-conference performer in both sports. Amplo graduated from Hofstra in 2000 with a bachelor’s degree in geography and earned a master’s degree in college student counseling. He and his wife, Jennifer, reside in Cedarburg, Wisconsin and have three daughters, Sophia, Charlotte, and Lily.